The ambient beauty of Brian Eno. Photo by Sergio Dionisio/Getty Images. Eno’s captivating new solo album, Lux, is music for sleeping or for waking. The album is part of a long continuum of ambient explorations that reaches back nearly four decades to Discreet Music. It is also a signpost in the long continuum of Eno’s life and work. His projects through the years have been tremendously varied, but they are well-integrated with each other—and with his views on music, art, and life. There are albums and productions and installations and iPad apps, but they all well up from the same consistent aesthetic. Discreet Music is inextricably encoded in Lux’s DNA. The essay on the back cover of Discreet Music—and the album itself—was a manifesto for a way of making music. Eno was interested in creating systems that could create music on their own, with little or no human intervention, inspired by the ‘60s tape experiments of composers like Steve Reich, his own experiments with the guitarist Robert Fripp, and a general interest in cybernetics. “It is a point of discipline to accept this passive role, and, for once, to ignore the tendency to play the artist by dabbling and interfering,” Eno wrote. Lux was created, in part, using such a system, using different permutations of the same seven notes. Lux was originally conceived as part of the ambience of an environment, as a sound installation in July for an ornate building known as the Great Gallery of the Palace of Venaria in Turin, Italy. The gallery—a grand Baroque passageway, built in the 1700s—forms the bridge between two palaces. Massive arched windows line the sides of the gallery, flooding the space with light. High, vaulted ceilings soar above, covered in extravagant scrollwork. The space possesses a tremendous amount of reverb, as many old cathedrals do, so the building acts almost like an instrument of its own, adding itself to the sounds in the air. 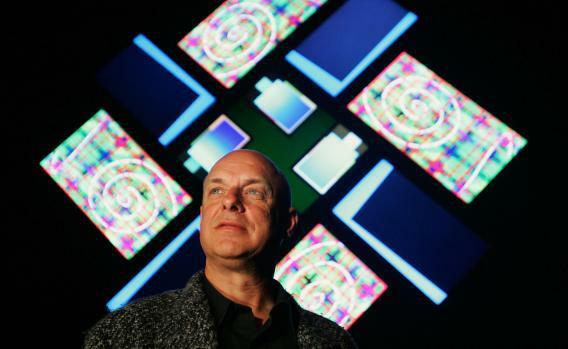 “You snap your fingers, and the sound goes on for 11 seconds,” said Eno in a recent Guardian interview. In a space like that, the slow-moving notes of Lux linger, chiming with each other in unexpected ways. Lux is spare in its textures, restrained in its arrangement. Piano notes hang in the air with a long sustain, occasionally accentuated by subtle strings. (The sparse, cryptic liner notes also make reference to a Moog guitar.) Take Lux out of the grandiose backdrop of an Italian palace and into humdrum everyday reality, and it has a dewy emotionalism—evocative of another time and place without drawing much attention to itself. It is good music to play in the background while working on something else—“music for thinking,” as Eno would put it, or music that is “as ignorable as it is interesting,” as he described Music for Airports in 1978. I tested Lux in a variety of situations; it sounded almost as good piped through tinny laptop speakers as it did on deluxe 180-gram vinyl on a “proper setup.” It worked well as nighttime music and as gentle music for the raw, early light of morning. I tried Lux on a normally hyperactive cat that stood in quiet attention before reclining luxuriously in relaxation on a mat in the kitchen. I played Lux simultaneously with Neroli, an ambient album Eno released in 1993, and the two complemented each other. Neroli fills in Lux’s airy spaciousness, adding to it without overpowering it. Neroli, which Eno billed as “Music for Thinking: Part IV,” is Lux’s closest sonic relative. Neroli also gained some traction as soothing music for pregnant women in wards, if some accounts are to be believed. But Neroli is darker than Lux; it contains more tension. Lux builds into quietly ecstatic peaks before slowly dissolving; any abrasiveness fades almost as quickly as it appears. Lux was originally designed to be less bright than it turned out to be. “What I had composed—in my studio in London, wrapped up in England’s grey climate—was introspective and somewhat dark,” Eno writes in the materials supplied with the installation. “There was not doubt in my mind that it was an ‘interior’ track. What is most striking about the Great Gallery—and you realize as much only when you step into it—is that it is soaked in light and space: nothing further from an ‘interior’ feeling.” Eno then worked on the piece in the gallery itself, altering it to fit the space. Lux also shares similarities with the smeared, hazy transcendence of Thursday Afternoon, a 1985 Eno ambient album that was originally composed as the soundtrack for a transfixing series of “video paintings” in 1984. Another parallel is the music of Eno’s erstwhile collaborator and friend Harold Budd, whose delicate, spare piano figures, with ample helpings of the sustain pedal, seem at once deliciously simple and deeply emotional—and almost cosmically transporting. Lux is Eno’s first solo album in several years and his most entrancing recent work. While releasing an album of ambient music in 2012 is considerably less groundbreaking than it was in the 1970s, Lux is still unmistakably, quintessentially Eno. And sometimes being beautiful is reason enough.